An update is available for OneCalendar today with ability to search your notes on the calendar view. The pages on the calendar view (month, week or day) will be filtered using the keywords entered. This uses OneNote's instant search so it will be the same result you will get when searching in OneNote. To search, click on the search box or hit Ctrl+F and then start typing your keywords. Search will kick in as you type and you will see the results instantly. Fixed a bug where modifying text with surrogate pairs will end up exposing the Unicode code point of the surrogate pair. Fixed a bug where querying page objects in a section with a page filter would unnecessarily read all pages in the section even if they don't satisfy filters. Macros can now change paragraph type (e.g. from table to text) by setting text property. The last one made editing macros much easier as it freed at least me from using mouse to author and edit macros. tags should get a property "due date" set by the user. This property should be visualized in the OneCalendar. The calendar app pulls in too much information making it unusable. It would be a useful tool for me if it pulled in information tied to a selectable tag. Then, I could tailor the calendar to show what I needed it to show rather than pull any page with a date that falls in the month being shown. Just started using OnCalendar, fantastic app, Thanks. 1. Have text selectable so I can Copy and Paste the days work into a time sheet. 2. Show only Tagged Items for that day. DL-IND: Yes ESC cancelling the search sounds like a good idea. mikethefisherman: Please contact me so I can collect logs. Guest: Your problem seems different. You can just download OneCal.exe separately and put it wherever you want (e.g. you can put it on your desktop) and run from there. Nice feature, thank you Omertay! Perhaps we have the same issue. Some security types recommend stopping .exe files from running from the same general area of the computer where OneCalendar is installed (appdata). Omertay, if it is possible to install to another folder.?.?. I have seen a couple of postings about the add-in failing to load upon encountering a runtime error. I am having the same issue. I effected all windows updates and uninstalled and reinstalled the add-in to no avail. I have administrator privileges on my laptop, though it is a work computer. It worked on my old one - disk crashed - now I have a new one and the add-in will not work. Running Windows 7 Enterprise 64 bit, 32 bit One Note - downloaded the correct version. Suggestions? Can ESC button be assigned for cancelling the search? Steve, I think you need to run it once you have 2013, because the fonts installed with 2010 is different and the result won\'t look right. 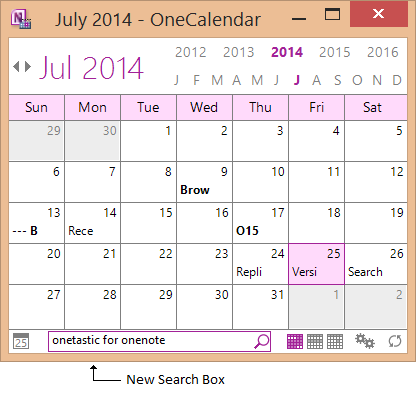 And Onetastic busts OneNote out into whole new altitudes! Search and Replace - super thanks! And so many others - thanks. One note - I tried the \"Title - Calibri Light 20\" to modify all the pages in a given section to the new OneNote 2013 look in prep for my future 2013 upgrade but it didn\'t work. It installed ok, I restarted OneNote 2010 and tried it a few times, it appeared busy for a bit but didn\'t make any changes or generate any error messages.